Gordo joined our rescue recently with some bad skin issues and he needed entropion surgery on both eyes. He is doing fabulous in his foster home and is turning into a very handsome young bull terrier! He gets along with the other bullies in his foster home and is now ready for a new family of his own. Gordo is under 2 years of age. 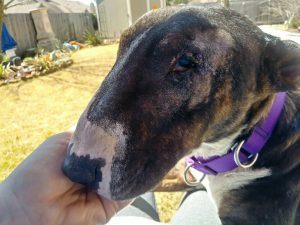 If you would like to bring Gordo into your family please visit our website – www.texasbullterrier.org – click on the Rescue tab and fill out an application!